Burning wood provides many homeowners with a way to eliminate the cost associated with electrically heating a home. Unfortunately, few homeowners can afford to purchase a kiln with which to dry fresh-cut wood, so the wood requires seasoning so it will burn easily without producing too much smoke that will pollute the air inside the home. Seasoning is a process used to cure and dry wood for drying, but takes as much as one or two years. Seasoning produces wood that creates more heat and less creosote build up in your stove or fireplace. Cut the wood into the smallest possible pieces. The smaller and thinner the wood is, the faster and better the wood will dry. Use a chainsaw to cut the wood into small sections and then split the wood using a splitting wedge and sledgehammer to start the split and then slit the wood further with an axe. Stack the wood in a garage or shed that allows fresh air circulation, but get the wood out of exposure to the elements. 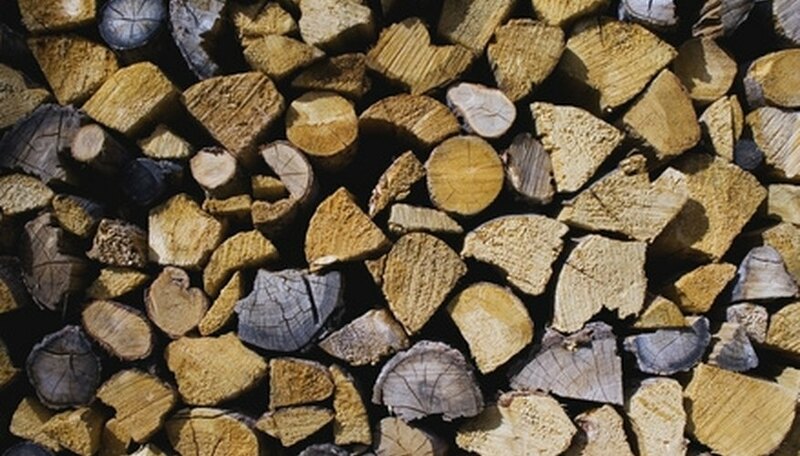 You want the wood exposed to heat to dry and season, so place the wood stack near a window. If you do not have a garage or shed for storing the wood, place the wood in a pile outside and wrap completely to prevent water from getting onto the wood and thwarting the drying process. Allow the wood to set for at least one year or longer before attempting to burn the wood inside your home. If you need to build an outdoor fire, you may burn the wood sooner, but be aware that wood not thoroughly seasoned produces much more smoke that dried wood. To speed the drying process further, place a dehumidifier in the garage or shed where you store the wood for drying. How Long Does Hickory Firewood Need to Season?